Smith was born in Kirkcaldy, in the County of Fife, in Scotland. His father, also of the same name, was a Scottish Writer to the Signet (senior solicitor), advocate, and prosecutor (Judge Advocate) and also served as comptroller of the Customs in Kirkcaldy. In 1720 he married Margaret Douglas, daughter of the landed Robert Douglas of Strathendry, also in Fife. His father died two months after he was born, leaving his mother a widow. The date of Smith's baptism into the Church of Scotland at Kirkcaldy was 5 June 1723, and this has often been treated as if it were also his date of birth, which is unknown. Although few events in Smith's early childhood are known, the Scottish journalist John Rae, Smith's biographer, recorded that Smith was abducted by gypsies at the age of three and released when others went to rescue him. [N 1] Smith was close to his mother, who probably encouraged him to pursue his scholarly ambitions. He attended the Burgh School of Kirkcaldy—characterised by Rae as "one of the best secondary schools of Scotland at that period"—from 1729 to 1737, he learned Latin, mathematics, history, and writing. Smith entered the University of Glasgow when he was fourteen and studied moral philosophy under Francis Hutcheson. Here, Smith developed his passion for liberty, reason, and free speech. In 1740 Smith was the graduate scholar presented to undertake postgraduate studies at Balliol College, Oxford, under the Snell Exhibition. Adam Smith considered the teaching at Glasgow to be far superior to that at Oxford, which he found intellectually stifling. In Book V, Chapter II of The Wealth of Nations, Smith wrote: "In the University of Oxford, the greater part of the public professors have, for these many years, given up altogether even the pretence of teaching." Smith is also reported to have complained to friends that Oxford officials once discovered him reading a copy of David Hume's Treatise on Human Nature, and they subsequently confiscated his book and punished him severely for reading it. According to William Robert Scott, "The Oxford of [Smith's] time gave little if any help towards what was to be his lifework." Nevertheless, Smith took the opportunity while at Oxford to teach himself several subjects by reading many books from the shelves of the large Bodleian Library. When Smith was not studying on his own, his time at Oxford was not a happy one, according to his letters. Near the end of his time there, Smith began suffering from shaking fits, probably the symptoms of a nervous breakdown. He left Oxford University in 1746, before his scholarship ended. Adam Smith's discontent at Oxford might be in part due to the absence of his beloved teacher in Glasgow, Francis Hutcheson. Hutcheson was well regarded as one of the most prominent lecturers at the University of Glasgow in his day and earned the approbation of students, colleagues, and even ordinary residents with the fervor and earnestness of his orations (which he sometimes opened to the public). His lectures endeavoured not merely to teach philosophy but to make his students embody that philosophy in their lives, appropriately acquiring the epithet, the preacher of philosophy. Unlike Smith, Hutcheson was not a system builder; rather it was his magnetic personality and method of lecturing that so influenced his students and caused the greatest of those to reverentially refer to him as "the never to be forgotten Hutcheson" – a title that Smith in all his correspondence used to describe only two people, his good friend David Hume and influential mentor Francis Hutcheson. In 1751, Smith earned a professorship at Glasgow University teaching logic courses, and in 1752 he was elected a member of the Philosophical Society of Edinburgh, having been introduced to the society by Lord Kames. When the head of Moral Philosophy died the next year, Smith took over the position. He worked as an academic for the next thirteen years, which he characterised as "by far the most useful and therefore by far the happiest and most honorable period [of his life]". Smith published The Theory of Moral Sentiments in 1759, embodying some of his Glasgow lectures. This work was concerned with how human morality depends on sympathy between agent and spectator, or the individual and other members of society. Smith defined "mutual sympathy" as the basis of moral sentiments. He based his explanation, not on a special "moral sense" as the Third Lord Shaftesbury and Hutcheson had done, nor on utility as Hume did, but on mutual sympathy, a term best captured in modern parlance by the twentieth-century concept of empathy, the capacity to recognise feelings that are being experienced by another being. In 1762, the University of Glasgow conferred on Smith the title of Doctor of Laws (LL.D.). At the end of 1763, he obtained an offer from Charles Townshend – who had been introduced to Smith by David Hume – to tutor his stepson, Henry Scott, the young Duke of Buccleuch. Smith then resigned from his professorship to take the tutoring position. He subsequently attempted to return the fees he had collected from his students because he resigned in the middle of the term, but his students refused. From Geneva, the party moved to Paris. Here Smith came to know several great intellectual leaders of the time; invariably having an effect on his future works. This list included: Benjamin Franklin, Turgot, Jean D'Alembert, André Morellet, Helvétius, and, notably, François Quesnay, the head of the Physiocratic school. So impressed with his ideas Smith considered dedicating The Wealth of Nations to him – had Quesnay not died beforehand. Physiocrats were opposed to mercantilism, the dominating economic theory of the time. Illustrated in their motto Laissez faire et laissez passer, le monde va de lui même! (Let do and let pass, the world goes on by itself!). They were also known to have declared that only agricultural activity produced real wealth; merchants and industrialists (manufacturers) did not. This however, did not represent their true school of thought, but was a mere "smoke screen" manufactured to hide their actual criticisms of the nobility and church; arguing that they made up the only real clients of merchants. The wealth of France was virtually destroyed by Louis XIV and Louis XV in ruinous wars, by aiding the American insurgents against the British, and perhaps most destructive (in terms of public perceptions) was what was seen as the excessive consumption of goods and services deemed to have no economic contribution – unproductive labour. Assuming that nobility and church are essentially detractors from economic growth, the feudal system of agriculture in France was the only sector important to maintain the wealth of the nation. Given that the English economy of the day yielded an income distribution that stood in contrast to that which existed in France, Smith concluded that the teachings and beliefs of Physiocrats were, "with all [their] imperfections [perhaps], the nearest approximation to the truth that has yet been published upon the subject of political economy". The distinction between productive versus unproductive labour – the physiocratic classe steril – was a predominant issue in the development and understanding of what would become classical economic theory. Smith was described by several of his contemporaries and biographers as comically absent-minded, with peculiar habits of speech and gait, and a smile of "inexpressible benignity". He was known to talk to himself, a habit that began during his childhood when he would smile in rapt conversation with invisible companions. He also had occasional spells of imaginary illness, and he is reported to have had books and papers placed in tall stacks in his study. According to one story, Smith took Charles Townshend on a tour of a tanning factory, and while discussing free trade, Smith walked into a huge tanning pit from which he needed help to escape. He is also said to have put bread and butter into a teapot, drunk the concoction, and declared it to be the worst cup of tea he ever had. According to another account, Smith distractedly went out walking in his nightgown and ended up Script error: No such module "convert". outside of town, before nearby church bells brought him back to reality. There has been considerable scholarly debate about the nature of Smith's religious views. Smith's father had shown a strong interest in Christianity and belonged to the moderate wing of the Church of Scotland. The fact that Adam Smith received the Snell Exhibition suggests that he may have gone to Oxford with the intention of pursuing a career in the Church of England. Anglo-American economist Ronald Coase has challenged the view that Smith was a deist, based on the fact that Smith's writings never explicitly invoke God as an explanation of the harmonies of the natural or the human worlds. According to Coase, though Smith does sometimes refer to the "Great Architect of the Universe", later scholars such as Jacob Viner have "very much exaggerated the extent to which Adam Smith was committed to a belief in a personal God", a belief for which Coase finds little evidence in passages such as the one in the Wealth of Nations in which Smith writes that the curiosity of mankind about the "great phenomena of nature", such as "the generation, the life, growth and dissolution of plants and animals", has led men to "enquire into their causes", and that "superstition first attempted to satisfy this curiosity, by referring all those wonderful appearances to the immediate agency of the gods. Philosophy afterwards endeavoured to account for them, from more familiar causes, or from such as mankind were better acquainted with than the agency of the gods". Smith was also a close friend and later the executor of David Hume, who was commonly characterised in his own time as an atheist. The publication in 1777 of Smith's letter to William Strahan, in which he described Hume's courage in the face of death in spite his irreligiosity, attracted considerable controversy. In 1759, Smith published his first work, The Theory of Moral Sentiments. He continued making extensive revisions to the book, up until his death. [N 2] Although The Wealth of Nations is widely regarded as Smith's most influential work, it is believed that Smith himself considered The Theory of Moral Sentiments to be a superior work. Scholars have traditionally perceived a conflict between The Theory of Moral Sentiments and The Wealth of Nations; the former emphasises sympathy for others, while the latter focuses on the role of self-interest. In recent years, however, some scholars of Smith's work have argued that no contradiction exists. They claim that in The Theory of Moral Sentiments, Smith develops a theory of psychology in which individuals seek the approval of the "impartial spectator" as a result of a natural desire to have outside observers sympathise with them. Rather than viewing The Theory of Moral Sentiments and The Wealth of Nations as presenting incompatible views of human nature, some Smith scholars regard the works as emphasising different aspects of human nature that vary depending on the situation. Ekelund and Hebert offer a differing view, observing that self-interest is present in both works and that "in the former, sympathy is the moral faculty that holds self-interest in check, whereas in the latter, competition is the economic faculty that restrains self-interest." The neoclassical interest in Smith's statement about "an invisible hand" originates in the possibility to see it as a precursor of neoclassical economics and its General Equilibrium concept. Samuelson's "Economics" refers 6 times to Smith's "invisible hand". To emphasise this relation, Samuelson quotes Smith's "invisible hand" statement putting "general interest" where Smith wrote "public interest". Samuelson concluded: "Smith was unable to prove the essence of his invisible-hand doctrine. Indeed, until the 1940s no one knew how to prove, even to state properly, the kernel of truth in this proposition about perfectly competitive market." Alfred Marshall criticised Smith's definition of economy on several points. He argued that man should be equally important as money, services are as important as goods, and that there must be an emphasis on human welfare, instead of just wealth. Nobel Prize-winning economist Joseph E. Stiglitz says, on the topic of one of Smith's better known ideas: "the reason that the invisible hand often seems invisible is that it is often not there." In light of the arguments put forward by Smith and other economic theorists in Britain, academic belief in mercantalism began to decline in England in the late 18th century. During the Industrial Revolution, Britain embraced free trade and Smith's laissez-faire economics, and via the British Empire, used its power to spread a broadly liberal economic model around the world, characterised by open markets, and relatively barrier free domestic and international trade. Paul Samuelson finds in Smith's pluralist use of supply and demand as applied to wages, rents, profit a valid and valuable anticipation of the general equilibrium modelling of Walras a century later. Smith's allowance for wage increases in the short and intermediate term from capital accumulation and invention contrasted with Malthus, Ricardo, and Karl Marx in their propounding a rigid subsistence–wage theory of labour supply. Classical economists presented competing theories of those of Smith, termed the "labour theory of value". Later Marxian economics descending from classical economics also use Smith's labour theories, in part. The first volume of Karl Marx's major work, Capital, was published in German in 1867. In it, Marx focused on the labour theory of value and what he considered to be the exploitation of labour by capital. The labour theory of value held that the value of a thing was determined by the labour that went into its production. This contrasts with the modern contention of neoclassical economics, that the value of a thing is determined by what one is willing to give up to obtain the thing. The bicentennial anniversary of the publication of The Wealth of Nations was celebrated in 1976, resulting in increased interest for The Theory of Moral Sentiments and his other works throughout academia. After 1976, Smith was more likely to be represented as the author of both The Wealth of Nations and The Theory of Moral Sentiments, and thereby as the founder of a moral philosophy and the science of economics. His homo economicus or "economic man" was also more often represented as a moral person. Additionally, economists David Levy and Sandra Peart in "The Secret History of the Dismal Science" point to his opposition to hierarchy and beliefs in inequality, including racial inequality, and provide additional support for those who point to Smith's opposition to slavery, colonialism, and empire. They show the caricatures of Smith drawn by the opponents of views on hierarchy and inequality in this online article. Emphasized also are Smith's statements of the need for high wages for the poor, and the efforts to keep wages low. In The "Vanity of the Philosopher": From Equality to Hierarchy in Postclassical Economics Peart and Levy also cite Smith's view that a common street porter was not intellectually inferior to a philosopher, and point to the need for greater appreciation of the public views in discussions of science and other subjects now considered to be technical. They also cite Smith's opposition to the often expressed view that science is superior to common sense. Smith's chapter on colonies in turn would help shape British imperial debates from the mid-nineteenth century onward. The Wealth of Nations would become an ambiguous text regarding the imperial question. In his chapter on colonies, Smith pondered how to solve the crisis developing across the Atlantic among the empire's thirteen American colonies. He offered two different proposals for easing tensions. The first proposal called for giving the colonies their independence and, by thus parting on a friendly basis, Britain would be able to develop and maintain a free-trade relationship with them, and possibly even an informal military alliance. Smith's second proposal called for a theoretical imperial federation that would bring the colonies and the metropole closer together through an imperial parliamentary system and imperial free trade. Smith's most prominent disciple in nineteenth-century England, peace advocate Richard Cobden, preferred the first proposal. Cobden would lead the Anti-Corn Law League in overturning the Corn Laws in 1846, shifting England to a policy of free trade and empire "on the cheap" for decades to come. This hands-off approach toward the British Empire would become known as Cobdenism or the Manchester School. By the turn of the century, however, advocates of Smith's second proposal such as Joseph Shield Nicholson would become ever more vocal in opposing Cobdenism, calling instead for imperial federation. As Marc-William Palen notes: "On the one hand, Adam Smith’s late nineteenth and early twentieth-century Cobdenite adherents used his theories to argue for gradual imperial devolution and empire ‘on the cheap’. On the other, various proponents of imperial federation throughout the British World sought to use Smith’s theories to overturn the predominant Cobdenite hands-off imperial approach and instead, with a firm grip, bring the empire closer than ever before." Smith's ideas thus played an important part in subsequent debates over the British Empire. A large-scale memorial of Smith by Alexander Stoddart was unveiled on 4 July 2008 in Edinburgh. It is a Script error: No such module "convert".-tall bronze sculpture and it stands above the Royal Mile outside St Giles' Cathedral in Parliament Square, near the Mercat cross. 20th-century sculptor Jim Sanborn (best known for the Kryptos sculpture at the United States Central Intelligence Agency) has created multiple pieces which feature Smith's work. At Central Connecticut State University is Circulating Capital, a tall cylinder which features an extract from The Wealth of Nations on the lower half, and on the upper half, some of the same text but represented in binary code. At the University of North Carolina at Charlotte, outside the Belk College of Business Administration, is Adam Smith's Spinning Top. Another Smith sculpture is at Cleveland State University. He also appears as the narrator in the 2013 play The Low Road, centred on a proponent on laissez-faire economics in the late eighteenth century but dealing obliquely with the financial crisis of 2007–2008 and the recession which followed – in the premiere production, he was portrayed by Bill Paterson. Adam Smith resided at Panmure house from 1778–90. This residence has now been purchased by the Edinburgh Business School at Heriot Watt University and fundraising has begun to restore it. Part of the Northern end of the original building appears to have been demolished in the 19th century to make way for an iron foundry. However, other writers have argued that Smith's support for laissez-faire (which in French means leave alone) has been overstated. Herbert Stein wrote that the people who "wear an Adam Smith necktie" do it to "make a statement of their devotion to the idea of free markets and limited government", and that this misrepresents Smith's ideas. Stein writes that Smith "was not pure or doctrinaire about this idea. He viewed government intervention in the market with great skepticism...yet he was prepared to accept or propose qualifications to that policy in the specific cases where he judged that their net effect would be beneficial and would not undermine the basically free character of the system. He did not wear the Adam Smith necktie." In Stein's reading, The Wealth of Nations could justify the Food and Drug Administration, the Consumer Product Safety Commission, mandatory employer health benefits, environmentalism, and "discriminatory taxation to deter improper or luxurious behavior". Economic historians such as Jacob Viner regard Smith as a strong advocate of free markets and limited government (what Smith called "natural liberty") but not as a dogmatic supporter of laissez-faire. Economist Daniel Klein believes using the term "free market economics" or "free market economist" to identify the ideas of Smith is too general and slightly misleading. Klein offers six characteristics central to the identity of Smith's economic thought and argues that a new name is needed to give a more accurate depiction of the "Smithian" identity. Economist David Ricardo set straight some of the misunderstandings about Smith's thoughts on free market. Most people still fall victim to the thinking that Smith was a free market economist without exception, though he was not. Ricardo pointed out that Smith was in support of helping infant industries. Smith believed that the government should subsidise newly formed industry, but he did fear that when the infant industry grew into adulthood it would be unwilling to surrender the government help. Smith also supported tariffs on imported goods to counteract an internal tax on the same good. Smith also fell to pressure in supporting some tariffs in support for national defence. Some have also claimed, Emma Rothschild among them, that Smith supported a minimum wage. ↑ In Life of Adam Smith, Rae writes, "In his fourth year, while on a visit to his grandfather's house at Strathendry on the banks of the Leven, [Smith] was stolen by a passing band of gypsies, and for a time could not be found. But presently a gentleman arrived who had met a gypsy woman a few miles down the road carrying a child that was crying piteously. Scouts were immediately dispatched in the direction indicated, and they came upon the woman in Leslie wood. As soon as she saw them she threw her burden down and escaped, and the child was brought back to his mother. [Smith] would have made, I fear, a poor gypsy." ↑ Scott, W. R. "The Never to Be Forgotten Hutcheson: Excerpts from W. R. Scott," Econ Journal Watch 8(1): 96–109, January 2011. ↑ Stewart, D., 1799, Essays on Philosophical Subjects, to which is prefixed An Account of the Life and Writings of the Author by Dugald Steward, F.R.S.E., Basil; from the Transactions of the Royal Society of Edinburgh, Read by M. Steward, 21 January, and 18 March 1793; in: The Glasgow edition of the Works and Correspondence of Adam Smith, 1982, vol. 3, pp. 304 ff. ↑ Smith, A., 1976, The Wealth of Nations edited by R. H. Campbell and A. S. Skinner, The Glasgow edition of the Works and Correspondence of Adam Smith, vol. 2b, pp. 678. ↑ "First Visit to London". Library of Economics and Liberty. Retrieved 22 May 2008. ↑ Boswell's Life of Johnson, 1780. ↑ Stewart, Dugald (1853). The Works of Adam Smith: With An Account of His Life and Writings. London: Henry G. Bohn. lxix. OCLC 3226570. ↑ "Times obituary of Adam Smith". The Times: http://en.wikisource.org/wiki/The_Times/1790/Obituary/Adam_Smith. 24 July 1790. ↑ "Hume on Religion". Stanford Encyclopedia of Philosophy. Retrieved 26 May 2008. ↑ Eric Schliesser (2003). "The Obituary of a Vain Philosopher: Adam Smith's Reflections on Hume's Life" (PDF). Hume Studies 29 (2): 327–362. ↑ "Adam Smith, Glasgow Edition of the Works and Correspondence Vol. 1 The Theory of Moral Sentiments ". The Online Library of Liberty. Retrieved 31 January 2010. ↑ Falkner, Robert (1997). "Biography of Smith". Liberal Democrat History Group. Archived from the original on 11 June 2008. Retrieved 14 May 2008. ↑ Brue, Stanley L., and Randy R. Grant. The Evolution of Economic Thought. Mason: Thomson Higher Education, 2007. ↑ Ekelund, R & Hebert, R 2007, A History of Economic Theory and Method 5th Edition. Waveland Press, United States, p. 105. ↑ Smith, A., 1976, The Wealth of Nations edited by R. H. Campbell and A. S. Skinner, The Glasgow edition of the Works and Correspondence of Adam Smith, vol. 2a, p. 456. ↑ Smith, A., 1980, The Glasgow edition of the Works and Correspondence of Adam Smith, vol. 3, p. 49, edited by W. P. D. Wightman and J. C. Bryce, Oxford: Clarendon Press. ↑ Smith, A., 1976, The Glasgow edition of the Works and Correspondence of Adam Smith, vol. 1, pp. 184–5, edited by D. D. Raphael and A. L. Macfie, Oxford: Clarendon Press. ↑ Smith, A., 1976, The Glasgow edition of the Works and Correspondence of Adam Smith, vol. 2a, p. 456, edited by R. H. Cambell and A. S. Skinner, Oxford: Clarendon Press. ↑ Gopnik, Adam. "Market Man". The New Yorker (18 October 2010): 82. Retrieved 27 April 2011. ↑ "Adam Smith – Jonathan Swift". University of Winchester. Retrieved 11 February 2010. ↑ Stigler, George J. (1976). "The Successes and Failures of Professor Smith," Journal of Political Economy, 84(6), p. 1202. P p. 1199–1213, Also published as Selected Papers, No. 50 (PDF), Graduate School of Business, University of Chicago. ↑ Marshall, Alfred; Marshall, Mary Paley (1879). The Economics of Industry. p. 2. ↑ Jevons, W. Stanley (1879). The Theory of Political Economy (2nd ed.). p. xiv. ↑ "David M. Levy, Sandra J. Peart, The Secret History of the Dismal Science. Part I. Economics, Religion and Race in the 19th Century - Library of Economics and Liberty". econlib.org. ↑ Marc-William Palen, “Adam Smith as Advocate of Empire, c. 1870-1932,” Historical Journal 57: 1 (March 2014): 179-198. ↑ "Clydesdale 50 Pounds, 1981". Ron Wise's Banknoteworld. Archived from the original on 30 October 2008. Retrieved 15 October 2008. 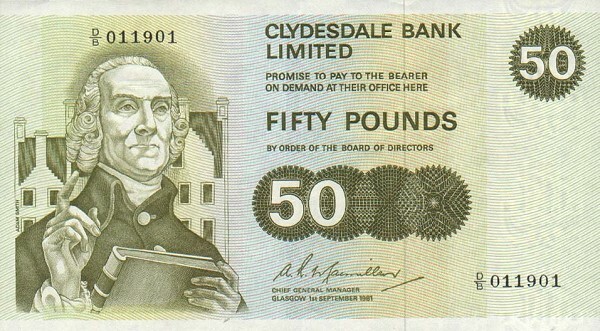 ↑ "Current Banknotes : Clydesdale Bank". The Committee of Scottish Clearing Bankers. Archived from the original on 3 October 2008. Retrieved 15 October 2008. ↑ "Smith replaces Elgar on £20 note". BBC. 29 October 2006. Archived from the original on 6 April 2008. Retrieved 14 May 2008. ↑ Blackley, Michael (26 September 2007). "Adam Smith sculpture to tower over Royal Mile". Edinburgh Evening News. ↑ Fillo, Maryellen (13 March 2001). "CCSU welcomes a new kid on the block". The Hartford Courant. ↑ Kelley, Pam (20 May 1997). "Piece at UNCC is a puzzle for Charlotte, artist says". Charlotte Observer. ↑ Shaw-Eagle, Joanna (1 June 1997). "Artist sheds new light on sculpture". The Washington Times. ↑ "Adam Smith's Spinning Top". Ohio Outdoor Sculpture Inventory. Archived from the original on 5 February 2005. Retrieved 24 May 2008. ↑ "The restoration of Panmure House". ↑ "Adam Smith's Home Gets Business School Revival". Bloomberg. ↑ "The Adam Smith Society". The Adam Smith Society. Archived from the original on 21 July 2007. Retrieved 24 May 2008. ↑ "The Australian Adam Smith Club". Adam Smith Club. Retrieved 12 October 2008. ↑ Levy, David (June 1992). "Interview with Milton Friedman". Federal Reserve Bank of Minneapolis. Retrieved 1 September 2008. ↑ "FRB: Speech, Greenspan – Adam Smith – 6 February 2005". Archived from the original on 12 May 2008. Retrieved 31 May 2008. ↑ "Adam Smith: Web Junkie – Forbes.com". 5 July 2007. Archived from the original on 20 May 2008. Retrieved 10 June 2008. ↑ Stein, Herbert (6 April 1994). "Board of Contributors: Remembering Adam Smith". The Wall Street Journal Asia: A14. ↑ Brown, Vivienne; Pack, Spencer J.; Werhane, Patricia H. (January 1993). "Untitled review of 'Capitalism as a Moral System: Adam Smith's Critique of the Free Market Economy' and 'Adam Smith and his Legacy for Modern Capitalism'". The Economic Journal 103 (416): 230–232. JSTOR 2234351. doi:10.2307/2234351. ↑ "Market Man". The New Yorker. 18 October 2010. ↑ Viner, Jacob (April 1927). "Adam Smith and Laissez-faire". The Journal of Political Economy 35 (2): 198–232. JSTOR 1823421. doi:10.1086/253837. ↑ Klein, Daniel B. (2008). "Toward a Public and Professional Identity for Our Economics". Econ Journal Watch 5 (3): 358–372. ↑ Klein, Daniel B. (2009). "Desperately Seeking Smithians: Responses to the Questionnaire about Building an Identity". Econ Journal Watch 6 (1): 113–180. ↑ 132.0 132.1 Buchholz, Todd (December 1990). pp. 38–39. ↑ Martin, Christopher. "Adam Smith and Liberal Economics: Reading the Minimum Wage Debate of 1795–96," Econ Journal Watch 8(2): 110–125, May 2011 . Coase, R.H. (October 1976). "Adam Smith's View of Man". The Journal of Law and Economics 19 (3): 529–546. doi:10.1086/466886. Smith, Vernon L. (July 1998). "The Two Faces of Adam Smith". Southern Economic Journal 65 (1): 2–19. doi:10.2307/1061349. 40x40px Wikisource has the text of A Short Biographical Dictionary of English Literature's article about Smith, Adam. 40x40px Wikimedia Commons has media related to Adam Smith.